This bachelor's programme is offered by the Department of Literature. You will focus on the academic analysis of literature written in French (literature of France and former colonies). You will be introduced to various methodologies from literary theory, literary history as well as cultural studies and cultural theory and thus learn how to analyse and reflect critically on literature and to speak and write about it with authority. The linguistic modules deal systematically with the structure and history of the French language. Your courses may include, in addition to the core areas phonology, morphology, syntax and semantics, courses on language acquisition, on the French varieties etc. In the practical courses you will improve your own French language skills. You will also attend courses on regional and cultural studies, oral and written language skills, listening comprehension, translation and grammar. When studying for a bachelor's degree in the humanities, you will choose both a major subject (120 credits) and a minor subject (40 credits). In addition to this you will attend courses from the field of key competencies (20 credits), including an internship. 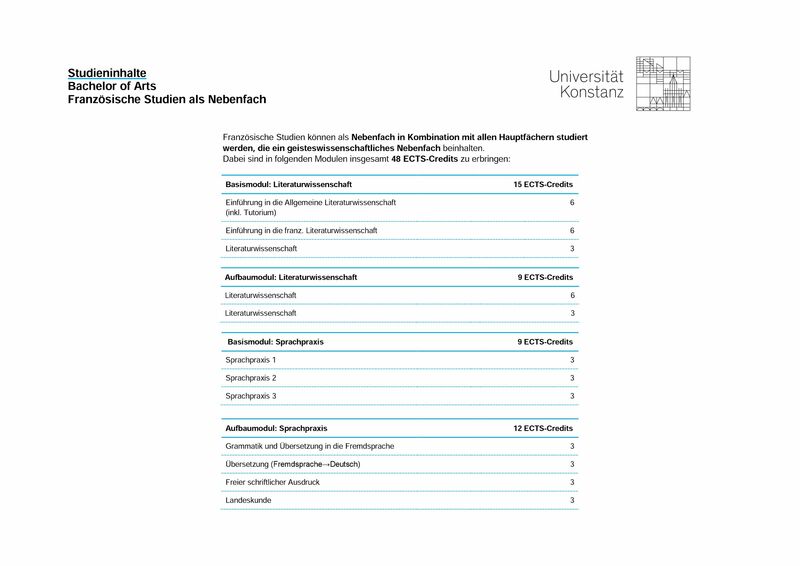 Click here for an overview of the general structure of bachelor's programmes in the humanities. You can find an exemplary structure of the study programme in this table. You have to document skills in another foreign language. You do not have to document any French language skills in your application. However, basic French language skills are highly recommended to start the study programme. If you do have no, or only little, French language skills, you can complete a preliminary language course ("Propädeutikum") at our Language Institute (SLI) of up to two semesters. You will find an overview of the required application documents in your application for admission, which you will receive at the end of your online application. The bachelor’s programme in French Literature is a literary study programme focusing on French literature. It is comprised of linguistics and language components that will enable you to discuss and write about literature in a manner that is analytical and informed by methodology.